used at home, office and other places. Good climbing machine for simple exercise and don't hesitate to buy it. √ For Whole Body Workout: PEXMOR foldable climbing machine is designed for low impact, high intense and full body workout. Users can exercise biceps, triceps, core and leg muscle at the same time. With climbing workout, users can burn more calories than treadmill in the same amount of time. √ Durable Construction & Safety Performance: Vertical climber exercise machine with resistance is using high quality square steel tube, which designs to ensure stability when you workout. The pedal of the stair climber machine is anti-skid, which can effectively prevent you from slipping out in the course of movement, ensure the safety of use. Maximum capacity: 350 lbs. 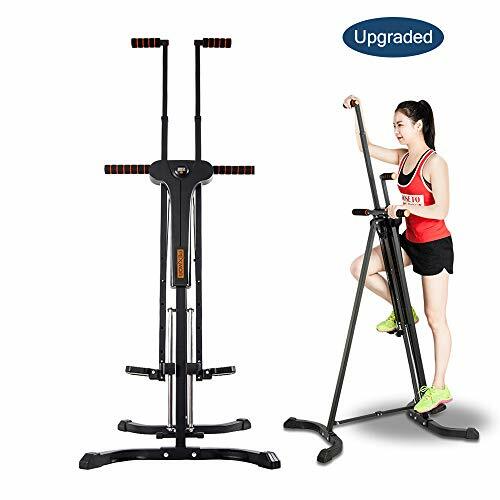 √ 5 Adjustable Height & LCD Monitor: This steppers for exercise offers five adjustable height to ensure you getting the all-round various upper and lower body workouts. It is also safe to prevent injury for beginners. The LCD display circularly shows time, distance and calories burned during your exercise, which is very convenient during your exercise workout. √ Easy Assembly & Folding Design: Comes 90% pre-assembled. Clear and brief instruction make it much easier to put together. Aims at easy storage and space saving, this stair stepper exercise machine can be easily folded up and put in the corner when not in use. It is not only suitable for gym, but it also can be used at home, office and other places. √ Specifications: If you have knee problem, please follow your doctor's advice to use this machine. Product dimension: 28.7 x 37 x 59.8-75.2 inch (L x W x H), Folding dimension: 28.7 x 19.6(L x W). 30-Days money back guarantee and 2-Year warranty apply to Vertical Climber. If you have any questions about this product by PEXMOR, contact us by completing and submitting the form below. If you are looking for a specif part number, please include it with your message.